A conservation plan puts science ahead of politics. As the small Cessna airplane flies above Tucson, its passengers see the rugged, low-lying Tortolita Mountains to the east, followed by the huge green blocks of cotton fields. Over to the west, the bright blue Central Arizona Project canal slices through the desert. Farther south rise the untrammeled desert mountains of Saguaro National Park-West. This aerial view showcases both the conservation successes and failures in the Sonoran Desert surrounding Tucson, whose population totals about 1 million. In the past 17 years, Pima County has spent nearly $200 million, raised through voter-approved bond issues, to preserve more than 200,000 acres of deserts, mountain parks, riparian areas and grasslands. Though red-tile roofs dominate much of the land, which is surrounded by five publicly owned mountain ranges, you can still see plenty of open desert dotted with dark green mesquite and palo verde and gray-green cactus. The county’s preservation efforts have also put it in the cattle business. The protected lands include 140,000 acres on which the county controls grazing leases. Ranchers who once feared that their remote mesquite flats and grasslands would be gobbled up by speculators still ply their trade, albeit with much-reduced cattle numbers. All of this is thanks to one of the most aggressive and ambitious urban land conservation efforts ever undertaken in the Southwest. Approved in fall 2016 by the U.S. Fish and Wildlife Service after nearly 20 years of work, Pima County’s Multi-Species Conservation Plan transformed the politics of a region that was infamous for endless sprawl. It protects dozens of vulnerable species and conserves biologically sensitive lands while permitting development on other lands, thereby ending conflicts over growth that had dragged on for decades. The plan has become a national model, drawing praise from scholars, land planners and environmentalists around the country — particularly for the way it insulated scientific input from political considerations. Pima County’s habitat conservation plan grew out of a culture of runaway development and extreme political conflict. The catalyst was the 1997 federal endangered species listing for the cactus ferruginous pygmy owl, a small raptor whose desert-wash habitat was imperiled by development and groundwater pumping. Until then, the county had routinely approved major rezonings for well over two decades, despite opposition from local environmentalists. At the time, the desert was being paved at the rate of an acre every two hours, pushing Tucson’s suburbs toward the edge of the surrounding national forest and parkland. The pygmy owl’s listing resulted in significant growth restrictions. Hoping to avoid similar controversy and litigation over other species, Pima County Administrator Chuck Huckelberry and his staff, prodded by environmentalists, started work a year after the listing on a long-term Sonoran Desert Conservation Plan to protect the county’s natural and cultural resources. As part of that effort, they developed a plan to protect dozens of imperiled species. To determine which lands were most essential to wildlife, they created a “firewall” around a committee of scientists, insulating them from political pressure. “County leaders stated from the outset that their primary goal was to conserve biological diversity through a scientifically defendable process, not to come up with a plan that everybody could agree on,” wrote the late urban planning specialist Judith Layzer in her 2008 book Natural Experiments, which analyzed more than a half-dozen regional land-conservation efforts. The scientists and county staff discussed the plan in public sessions, but county officials made it clear that their work would not be derailed by complaints from developers and other critics. The scientists established standards for identifying biologically valuable lands and used computer models, observation records and the judgment of local naturalists and recognized experts to come up with a biological preserve map. In contrast, in other multi-species plans, scientists, politicians, agency staffers, developers and moderate conservationists collectively determined which lands to save, thus bringing political and economic considerations into the science. After the science team created a map of the proposed preserve system, a separate steering committee of 84 people, including developers, environmentalists and neighborhood leaders, haggled over its details. By then, though, the plan’s broad vision was already solidly in place. The scientists’ work led to the creation of the Conservation Lands System, 3 million acres of picture-book Sonoran Desert, grasslands and riparian areas, with about 60 percent of it preserved as open space. Nine of the 44 vulnerable species protected by the system are on the federal endangered species list, including the Gila topminnow, the western yellow-billed cuckoo and the Pima pineapple cactus. In 2003, the county took another major step by folding the multi-species plan into its broader Sonoran Desert Conservation Plan, which calls for conserving ranches, protecting culturally and historically sensitive properties and expanding an existing mountain park network. Developers, homebuilders and realtors initially howled at the proposed multi-species plan, but backed off after winning two concessions. First, Huckelberry promised not to propose additional land-use regulations. Second, the county agreed to give small landowners more leeway, because their projects have much less impact. “As soon as it was clear it was going that way, most of the opposition from private-property owners dissipated,” says realtor Bill Arnold, leader of a vocal property-rights movement. The plan’s backers say it also benefits developers. Within the million-acre area governed by the county’s federal Endangered Species Act permit, landowners who sign up for voluntary coverage under the plan are then exempt from prosecution for unintentionally killing or harming any federally protected species on their property. If any of 35 other species are later placed on the endangered species list, the landowners won’t be subject to new restrictions. The plan may also exempt them from protracted biological reviews if their projects need a federal Clean Water Act permit. Yet the county’s plan has limits to its power and scope, and now faces new challenges. 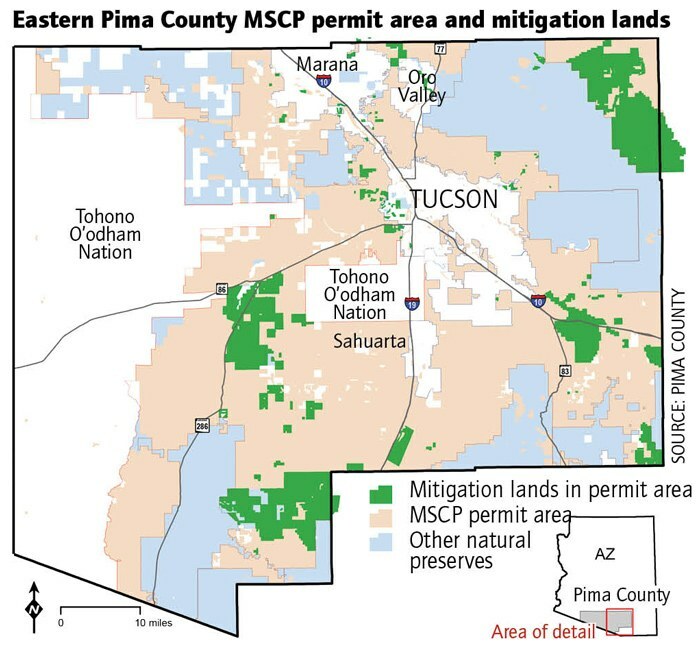 In a huge swath of desert grasslands southwest of Tucson, for instance, some of the county-owned ranchlands now are crossed by an underground natural gas pipeline, which left a scar on the land and may increase soil erosion. And in some of the prime foothills areas, tile roofs now dominate land that environmentalists had hoped to conserve; it has been rezoned for high-intensity development. And east of Tucson along the San Pedro River, a $2 billion power line project could damage grazing lands and riparian areas.